Attic Ladder (Metal Insulated) LMS 22 1/2 x 54 350lbs 10ft 1in The LMS powder-painted, ANSI approved, metal attic ladder is assembled in three sections. The LMS attic ladder is equipped with locking mechanism that is installed inside insulated and sealed door panel. The length of the ladder may be adjusted within 1 inch after cutting the side rails to set ladder evenly on floor. Construction of the LMS provides more steps (tread rise about 10 inches) to improve safety and comfort. A red, metal handrail is available for purchase and may be installed on either side of the ladder to increase safety and comfort. Brackets allow increasing space between ladder and attic door for comfort and safety. Springs are located on door surface to make entry to attic wider and more comfortable (the widest entrance on market - compare to other products). Door is well balanced - it opens and closes easily (NO sudden movements). Fits rough opening 22 1/2 in. x 54 in. and ceiling heights 7 ft. 11 in. to 10 ft.1 in. 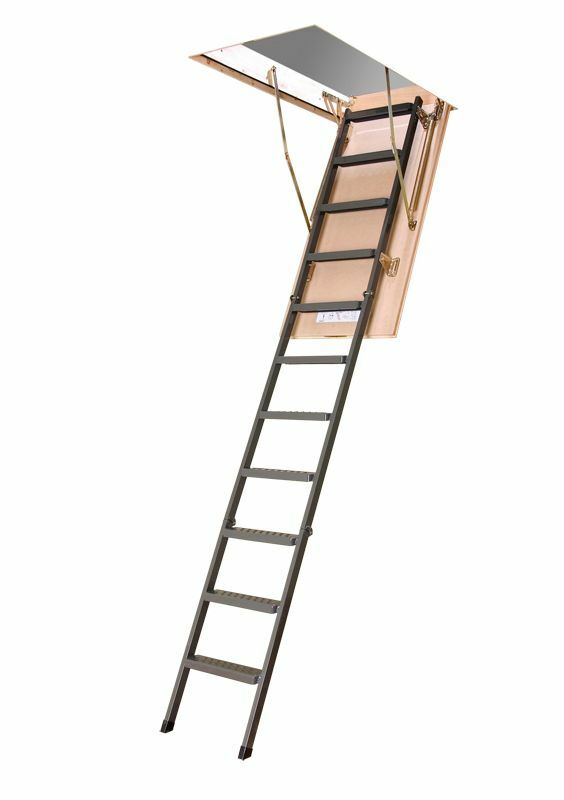 Attic Ladder (Metal Insulated) LMS 22 1/2 x 54 350lbs 10ft 1in is rated 4.1 out of 5 by 22. Rated 4 out of 5 by Ed from Very solid design. Installation went well using straps. Pull down... Very solid design. Installation went well using straps. Pull down rod is a little awkward. I will probably add a rope with handle. Rated 1 out of 5 by Rob from I had 3 of these ladders delivered and each one was damaged. They apparently do not know how to ... I had 3 of these ladders delivered and each one was damaged. They apparently do not know how to package these things for shipping. The 3rd one was supposed to have extra special packaging and all that amounted to was adding a couple of wrappings of clear plastic wrap. The corners have these weak pad things placed there but they come off during shipping. The box is too big given the size of the ladder. I bet they skimped and use the same box for the 25 inch wide one and don't compensate with more cushion. The 3rd one had the least amount of damage on the frame but still had a crack and this one had a dented step. I think it may have been damaged prior to shipping because there was no indication on the box that something could have hit the step violently enough to dent the steel. Looks like a drunk guy in their shipping site hit the think with a hammer to spite someone. Rated 5 out of 5 by Brenda from This Ladder is very high quality for the money and... This Ladder is very high quality for the money and I feel completely safe when climbing while bringing items up the the attic to store. Rated 5 out of 5 by Nancy from This is very sturdy ladder that fit well and was... This is very sturdy ladder that fit well and was easy to install. My electrician and heating and a/c contractors also like it because it is very stable when they need to carry things into the attic. Rated 3 out of 5 by chuxter from Ladder is pretty well made and is the second one I've used. There was a slight crack in the expos... Ladder is pretty well made and is the second one I've used. There was a slight crack in the exposed surface of the door panel which did not show up on the packaging material (1/8" mdf protective panel inserted in box as protection was not damaged) which leaves me to believe it left the factory that way. The frame is 3/4" thick finger joint pine, with a 3/8" rabbet for the door which leaves 3/8" to attach trim. The door when closed sets below the frame. I ended up making a custom frame which I installed first and also allowed me to lower it down from the attic by myself. The steel is sturdy, but I don't think my wife will be able to operate it due to the weight and height above the floor.Pictures shows narrow frame I made to attach trim and flush the door with the ceiling. Rated 4 out of 5 by nmharrier from Installation does take some time, but I am happy with the end result. I have had it for about 1 ... Installation does take some time, but I am happy with the end result. I have had it for about 1 month. The handrail accessory arrived slightly bent was still functional. Very convenient and safe way to access my attic space. Rated 3 out of 5 by Paaaaa from The ladder is a nice design, but a part was damaged during installation and I can't get the compa... The ladder is a nice design, but a part was damaged during installation and I can't get the company to return my email.